The garden beet or beetroot (Beta vulgaris) is a member of the amaranth family and an incredibly healthy root vegetable. According to scientific literature, the beetroot holds many benefits for human health, including anticancer, anti-inflammatory and blood pressure-lowering properties as well as an energy-boosting effect. The term ‘beetroot’ refers to the edible, principal root of the beet plant, while ‘beets’ denominates the entire beet plant: the taproot, or the principal root, together with the meaty stems and large leaves, also called beet greens. However, the two terms are often used interchangeably to denominate the edible taproot. The beetroot is also known as beet, garden beet or table beet. The sugar beet, the red beet, the purple beet, the yellow or golden beet and the white beet are all cultivars of the Beta vulgaris plant. What makes beetroot stand out is its strong red color, a result of natural pigments with strong anti-inflammatory and anticancer properties. What does beetroot (beet) look like? Depending on the variety, beets vary in color from white and golden-yellow to deep purple and rich red. The most common variety is the red beet. The vegetable has a rough outer skin that is usually peeled off and discarded. The more mature the vegetable, the rougher the skin. Red beets have a dark red, almost purple skin, golden beets have an orange-brown exterior while white beets have a dirty white skin color. Beetroot pulp may vary in color from a beautiful purplish color to rich red, golden-yellow or red-striped white. Beetroot can be harvested while still young so it preserves a certain tenderness and a uniform round shape reminiscent of turnips. If left to mature, it can become woody in texture and grow in length and girth, resulting massive vegetables the shape of huge turnips or parsnips. What does beetroot (beet) taste like? Fresh beetroot has a crisp, juicy texture and a pleasant, sweet taste, with no underlying bitterness. It’s somewhat similar to a lot sweeter and juicier carrots. It also has a slightly earthy flavor that is very nicely camouflaged by its sweetness. However, there are people who consider beets to be quite bland, preferring to season and roast or bake them, marinate or mix them with other more flavorful foods and salad dressings. Pickled beets are a very popular option. However, canned ones have a significantly inferior taste compared to home-cooked, raw and pickled beets. The green leaves and meaty stems of the plant are also edible and quite nutritious (see benefits of beet greens). 1) Anticancer properties. Betaine is a pigment occurring naturally in red beet and other amaranth family members. It is responsible for the red color of the vegetable and believed to hold miraculous cancer-curing properties. Research has shown that red beet extract and red beet juice containing large amounts of betaine can efficiently stop the progression of certain types of cancer (including estrogen-sensitive cancers and pancreatic cancer) by exerting a cytotoxic effect on malignant cells. 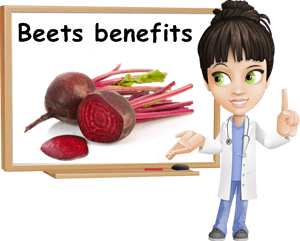 Moreover, red beetroot is an essential food in most anticancer or cancer-curing diets. The natural sugars in red beetroot are a perfect bait for cancer cells which rely on glucose to grow and divide, thus allowing for pivotal cancer-killing agents such as betaine, vitamin C, beta-carotene and manganese to enter their membrane and destroy them. 2) Blood pressure-lowering action. Research has shown that beetroot contains natural nitrates that our body turns into nitric oxide following digestion. Nitric oxide exerts a potent vasodilating effect, in other words it helps widen our blood vessels to allow for a good blood flow. This, in turn, lowers blood pressure, contributing to cardiovascular health. Drinking a glass of beetroot juice or eating a big serving of the vegetable can have almost instant effects on blood pressure. 3) Cholesterol-lowering and mild laxative effect. Beets provide us 2.8 g of dietary fiber for each 100 g of flesh. Dietary fiber does not allow us to absorb all the fat from the foods we eat, indirectly contributing to lowering LDL (bad) cholesterol and triglyceride levels. Moreover, beets are almost 88% water. Dietary fiber absorbs water to create bulk and trigger regular, healthy bowel movements, relieving constipation. 4) Potent anti-inflammatory action. Beetroot has an excellent anti-inflammatory potential as it contain potent anti-inflammatory compounds such as betaine, vitamin C and manganese. Regular consumption of both beetroot and beet greens is believed to help reduce inflammation markers such as C reactive protein and interleukin-6, the latter being owed to the high vitamin K content of beet greens. Betaine also reduces inflammation linked to cardiovascular disease. 5) Rich source of antioxidants. Beetroot contains powerful antioxidants such as betaine, vitamin C, manganese and beta-carotene (golden beet) as well as small amounts of other essential nutrients (potassium, riboflavin, folate, iron, magnesium, phosphorus and zinc). Eating them on a regular basis provides a generous intake of antioxidants to help fight free radical damage and protect cell and DNA integrity. 6) Energy boosting potential. Research shows that drinking beetroot juice prior to engaging in an intense workout routine can help improve endurance and extend workout time. Because of its nitrates content, beetroot improves blood flow and lowers high blood pressure. This, in turn, alters the exerciser’s perception of the effort felt during and after a workout routine, allowing for improved exercise performance. Betaine, the pigment in red beets responsible for that beautiful crimson, can color urine and bowel movements, mimicking the presence of blood. So remember not to be alarmed if either one become reddish in color after you have eaten beetroot. However, if the situation persists after discontinuing consumption, see a medical professional immediately.